Unclear is how the switch will impact the economy and relations with Russia. Powerbrokers in Armenia are set to elect a new president, completing the country’s controversial transition to a parliamentary system of governance. But this time, the president will have little power. The ruling Republican Party of Armenia (RPA) says the change democratizes the country’s politics, but critics say it thwarts the last remaining channels for genuine opposition. Under the terms of a controversial 2015 constitutional referendum, when President Serzh Sargsyan’s term expires this April the office of prime minister will become the most powerful in the country and the president will be downgraded to a ceremonial role. Sargsyan’s handpicked successor is running unopposed. In the coming days, businessman Armen Sarkissian, Yerevan’s ambassador to the United Kingdom, is expected to be elected by parliament. Many believe Sargsyan’s intention is then to slide into the premier’s seat. Armenia has been led by the same ruling party since 2007. The RPA has won a majority in each subsequent parliamentary election. And Sargsyan has shown no intention to leave office. The RPA is widely expected to appoint Sargsyan to be prime minister after the presidential vote. Failing that, he is least expected to remain chairman of the ruling party – granting him substantial authority behind-the-scenes. Critics say eliminating the direct election of the president will dilute the general population’s ability to keep authoritarian tendencies in check. Almost all prior national elections in Armenia have become the subject of fierce debate, with opposition forces accusing the government of fraud as far back as the 1990s. In March 2008, after the election that brought Sargsyan to power, protesters arguing that the election was rigged were violently suppressed by government forces. Ten died. Indeed, such machinations are becoming the norm in a region unaccustomed to democracy. In Russia, Vladimir Putin switched places with his prime minister, Dmitry Medvedev, in 2008, in a nod to the constitution, which allows presidents to serve only two consecutive terms. Few believed Medvedev wielded any real power and the duo was often jokingly referred to as the “tandem.” Putin resumed the presidency in 2012 after Medvedev had served one term. In Azerbaijan, in 2016, the president simply changed the constitution to prolong his term, while neighboring Georgia, like Armenia, transitioned to a parliamentary form of government to create opportunities for then-President Mikheil Saakashvili to retain power. But Saakashvili suffered a surprising defeat in the 2012 parliamentary elections, beaten by billionaire Bidzina Ivanishvili’s “Georgian Dream” alliance. “If Armenia succeeds where Georgia failed, it could set a precedent for autocrats across the region,” Zolyan said. The events surrounding Armenia’s constitutional changes certainly have the hallmarks of a power grab. More troubling, the December 2015 constitutional referendum – which officially downgraded the presidency – was marred by widespread voting irregularities and charges of abuse, undermining the public’s faith in the new system. The implications for the country’s economic future, as well as Yerevan’s close relations with Russia, are also unclear. Since Karen Karapetyan’s appointment in 2016, Samvel Karapetyan (no relation), an Armenian-born billionaire who has built a business empire in Russia, has become an increasingly powerful figure in the country. The men are close, with Samvel even loaning the prime minister his jet last month to attend the World Economic Forum in Davos. Samvel Karapetyan is also planning to build two hydroelectric plants and one waste-to-energy facility, together worth about $470 million. Removing the prime minister might put such projects at risk, said Danielyan. The oligarch has voiced strong backing for the premier. “We are going to defend and support him [the prime minister], and I’m sure that very soon goals will be scored every day,” he told reporters last March. Corruption seized the spotlight following the outbreak of fighting in Nagorno-Karabakh in April 2016. Revelations of inadequate equipment along the frontline confirmed suspicions of corruption in the defense sector. The deteriorating security situation also sparked political crisis. The following July, a group of armed men stormed a police station in Yerevan, taking several hostages. Their key demand was the resignation of President Sargsyan. The two-week standoff resulted in the death of two police officers, and riots across the city in response to the government’s handling of the crisis. In an opinion poll taken a year later, 38 percent of respondents reportedly supported the group’s actions, while just 16 percent condemned them. Political space has long been hollowed out, with the ruling party’s endemic use of administrative resources effectively closing opportunities for newcomers. In the run-up to parliamentary elections last year, an investigation by the Union of Informed Citizens, an NGO, revealed that 114 of 136 school directors polled had admitted campaigning in the schools on behalf of the RPA. The findings provoked a scandal. 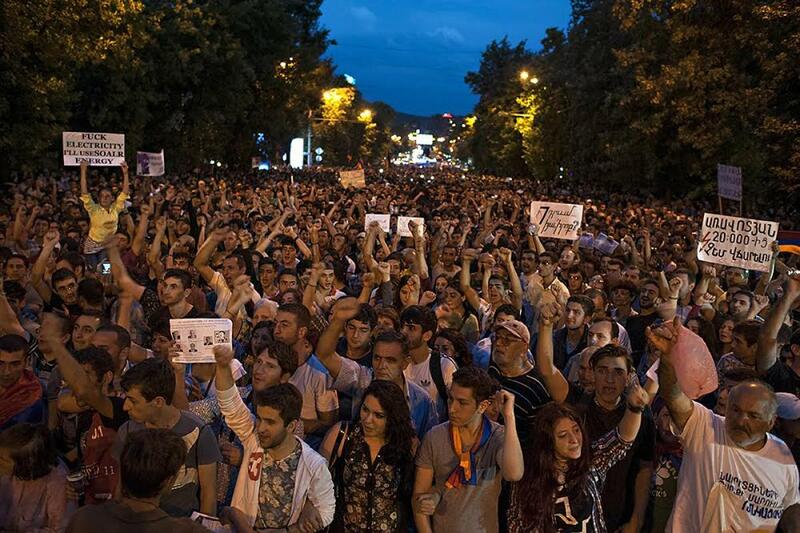 For now, the situation in Yerevan appears to be business as usual.